Everything old is new again. Greens have always been an important part of health. In the Bible we find "and they shall eat the flesh in that night, roast with fire, and unleavened bread, and with bitter herbs they shall eat it." Exodus 12:8 These bitter herbs were greens like sorrel, chicory and dandelion. Today, thankfully, we have many tasty leafy vegetables to choose from. 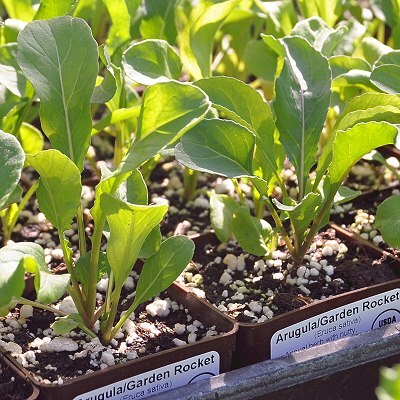 Arugula is a fast growing annual salad green that you either love or hate. It has a strong peppery mustard like flavor. Once used sparingly to add a bit of zing to a salad or stir-fry, it has become a star in its own right and young leaves are often found as the main ingredient in salad. One of our favorite leafy greens is Kale. We carry Lacinato Kale (sometimes referred to as Dinosaur Kale) and Red Russian Kale. Looking at a Kale leaf you might think it would have to be cooked to be edible but this is not true. A massaged Kale salad is one of the most delicious meals we make. And massaged Kale can be used a substitute for any recipe calling for spinach. Add a few mustard leaves to your Kale salad and the flavor profile takes on a whole new dimension. The amount of greens are up to you. The final product will reduce to about half of what you start with. Figure out how many cups of salad you want to end up with and double the number of cups of greens you start with. Kale, Mustard and baby Swiss Chard can all be fixed this way. Remove the ribs of the greens. These make tasty additions to soup and can be frozen for later use. Wash the greens and roll tightly in a clean kitchen towel. Refrigerate for at least 15 minutes. Remove from the towel and dry off any excess moisture. Roll the leaves together lengthwise and slice across the width into thin ribbons. Place the greens in a bowl large enough to toss them around. Add a tablespoon of Olive Oil and a sprinkle of salt. At this point, we like to add some feta choose also but this optional. Now massage the leaves with the oil until they have reduced by half. Your salad is ready! Obviously there are as many variations as there are cooks. But this basic recipe is delicious on its own. We also use it to make a delicious massaged kale lasagna. Be sure to prepare a lot of Kale for the dish. We also use Red Russian Kale leaves and Mustard leaves like lettuce on our sandwiches. 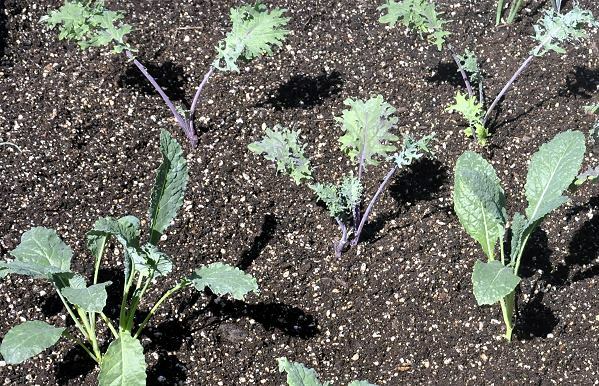 Pictured below is a newly planted Kale bed. Red Russian Kale is the frilly plant and Dinosaur Kale is the plant with the smooth-edged leaf. We are sorry but Red Russian Kale has been discontinued. Romaine lettuce is not only highly nutritious but also a blank canvas for creating salads of all kinds .It can be added to your smoothies and it's mild flavor will not overpower the drink. Parris Island has large thick green leaves with white ribs. It is tender and sweet and grows to 8 to 10 inches tall. An heirloom variety that is disease resistant and slow bolting. Takes about a month after transplanting for heads to form. Our new mustard mix features Green Wave and Red Giant broadleaf mustards. In addition to traditional cooked mustard greens, these wide, crisp leaves are wonderful fresh on a burger or salad. Add some to the Massaged Kale Salad above to jazz things up a bit! 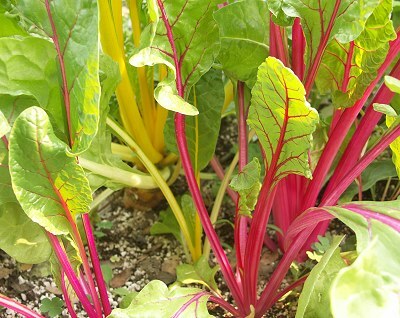 This blend of red, white and gold ribbed chard is not only beautiful in the garden but makes for some really colorful dishes as well. Small leaves can be eaten raw while ribs and older leaves are best sautéed. Collards are finally coming into their own as a superfood. They are just as nutritious as kale and just as easy to grow. Collards like a neutral to slightly below neutral pH, a fertile soil and at least 5 hours of sun each day. Planting about two feet apart allows the formation of large leaves without encroaching on its neighbor (which can sometimes cause leaf rot). Harvest all greens from the bottom up. If you don't get to the bottom leaves before they get tough, leave them and harvest the nest rung of leaves. We have discontinued Collard greens. For more information on all the greens we carry, including nutrition facts and recipes, please visit our pinterest board for ORGANIC GREENS. Height: Most of them are about two feet.